In April 1989 Brigitte Schrottenbacher went to her first meditation retreat in Thailand. During two months of intensive practice she gained some insight into the unsatisfactory, impermanent and non- self nature of the body and mind. Now for nearly 20 years Maechee Brigitte has lived in Thailand and practiced intensive meditation with distinguished Bhikkhus. She is a meditation master and Dhamma teacher of Thais and international students. She lives on almsfood and donations from Dhamma teachings, which sustain her, as well as, 60 other maechees. 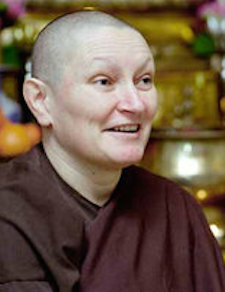 Since 2002 she has been touring Europe annually offering Dhamma teachings in many countries, and returning with offerings for Thai maechees and social service projects in Thailand. Maechee Brigitte: gives necessary items to the poorest of the region; supports the Tamkrabok Drug Withdrawal Temple in Saraburi; helps support the “AIDS Temple” in Lopburi; and built houses for 4 families of Tsunami victims on Lhanta Island.